literally it is "time of the year", "period of the year" . what is difference between "okres" and "pora roku"? Pora roku is "time of the year", that is "a season" - therefore for most of the world only spring/summer/autumn/winter. "okres" is simply some period of time, also the 'period' in Physics, and period = "this time of month" for a woman. Can 'pora' be translated to season also for sports or other activities? As in "Premier League season" or "hunting season". Nope, that's "sezon" for both of those meanings. Also a season of a TV series, for example. "Pora roku" is more like "time of the year", and in this way it translates to "a season". I tried 'winter is a time of year' but it said 'winter is a time of a year' is correct. I think it sounds more natural without 'a'. What diferent bitween "null season" and "season"
Hi, Is there any reason why it must be "Winter..." and cannot be "The Winter..." ? Thanks. I was told by two natives that neither an American nor a British person would use "the winter" here. 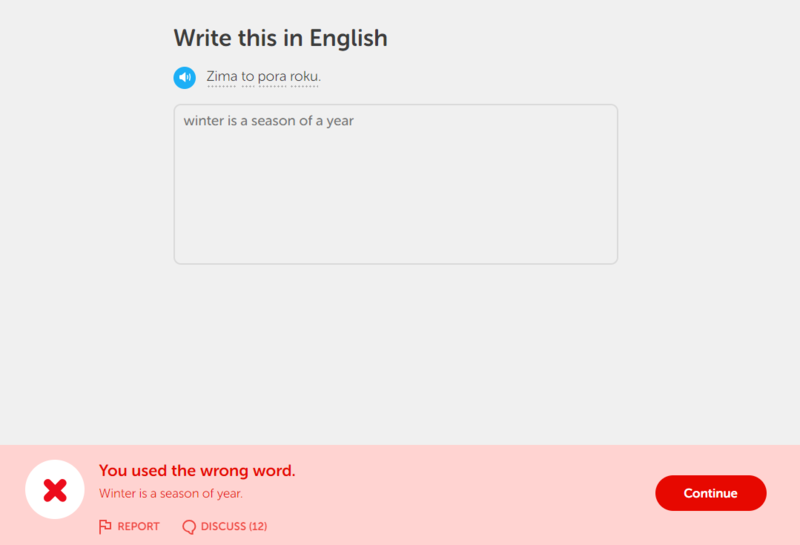 I wrote "Winter is a season of A year", the hint said "You used the wrong word. Winter is a season of year". Mistake in the Incubator, fixed now. Thanks.